You’ve probably noticed over the past few weeks that your facebook, twitter and Instagram feeds have been hijacked by friends and celebrities chucking buckets of icy water over their heads. Unless you’ve been living in the wild for the past few weeks you will know that this is because of the ALS Ice-Bucket Challenge. 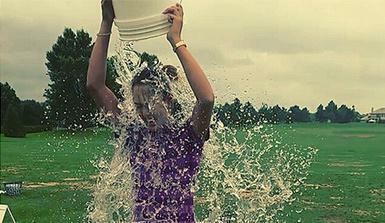 The premise is simple either dump a bucket of iced water over your head or donate to the ALS foundation. Once the challenge is completed, the participant nominates three people who then have 24 hours to either complete the challenge or donate $100. So far the challenge has been completed by a myriad of celebrities including; Bill Gates, Oprah Winfrey, Steven Spielberg and Mark Zuckerberg. The University of Miami’s official mascot Sebastian the Ibis undertook the ALS challenge in style and nominated fellow university mascots to get dunking. The video has received an overwhelming response on the Miami Hurricane’s social media sites as well as on the university’s official social media outlets. Two members of the University of Virginia Law Career Services proved what good sports they are when they allowed a bunch of students dump freezing containers of water over them….while wearing suits and ties. They then challenged the Career Services offices of Harvard, Yale and Stanford. You can check out the video here. Georgetown University’s most popular resident, their bulldog mascot Jack was nominated to complete the ALS ice-bucket challenge. The cute pup bravely endured the cold, no doubt determined to do his bit to raise funds and awareness for the ALS foundation. The ALS Ice-Bucket challenge may have garnered some bad press since it first went viral but regardless, it’s raising awareness and to date has helped raise $23 million for the ALS foundation. It’s all for a good cause and it’s a fun way for students and faculty members to get creative! Thank you! We have just sent you a confirmation email. All you need to do next is confirm the subscription by clicking on a link in that emai. Instantly receive new blog posts to your mailbox and a monthly digest mail.